It seems as if Star City will once again be looking for a new mayor. Paul Blackthorne who plays Mayor Quentin Lance is leaving the DC superhero show Arrow at the end of its sixth season. Blackthorne has been with Arrow since the very beginning and become an essential part in Oliver Queen (Stephen Amell) traversing Star City as both the former billionaire and superhero vigilante known as The Green Arrow. He also initially despised Oliver’s vigilante alter ego the Hood before slowly coming to work in tandem with the Emerald Archer, eventually discovering Oliver and the Green Arrow were one and the same.This will be the second series original leaving the show since Willa Holland who played Oliver’s sister, Thea Quinn earlier this season. Quentin Lance has gone through an array of emotions throughout the show. In the first season he dealt with the loss of his daughter Sara (played by Caity Lotz) only to find out later that she was indeed alive and had become a trained assassin…only to be killed again by Thea Queen only to be resurrected once again and become a LEGEND on DC’s Legends of Tomorrow. He also battled alcoholism after both Sara’s death and later on his other daughter Laurel (Katie Cassidy) at the hands of Damien Dahrk. Arrow was just recently renewed for its seventh season. Things are being kept very tight lip as to how exactly Blackthorne’s Quentin Lance will exit the show at the end of this season. Looks like your Trusty Sidekicks will be still be in business throughout this tv season and next. The CW has renewed seven of its series for the 2017-18 season, Variety has learned. The network has doled out early renewals to all its comic book franchises (“Arrow,” “D.C.’s Legends of Tomorrow,” “The Flash,” “Supergirl”) and to “Jane the Virgin,” “Crazy Ex-Girlfriend,” and “Supernatural.” The CW will also resurrect DC’s “Constantine” as an animated series starring the voice of Matt Ryan on digital outlet CW Seed, produced by Greg Berlanti. If you remember at the end of the first season of DC’s Legends of Tomorrow the remaining members of the team had their first run in with the “Hourman” Rex Tyler of the Justice Society of America and that sent the internet ablaze as whats to come for season two. 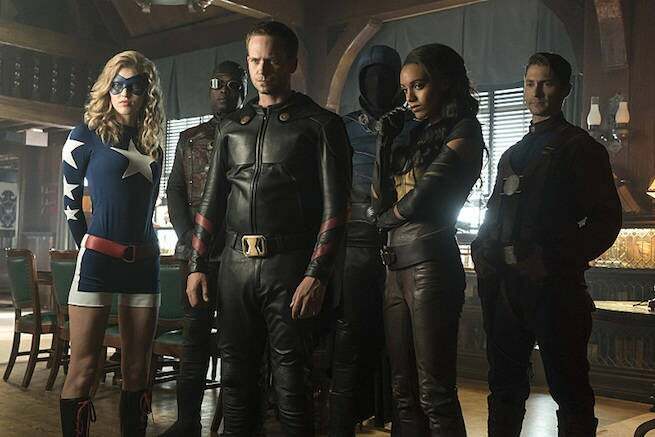 Well The CW has released the official promotional images for DC’s Legends of Tomorrow season two, episode two — and since it’s titled “The Justice Society of America,” you can pretty much guess who makes their first appearance! Stargirl, Obsidian, Commander Steel, Vixen, and Hourman make their first collective on-camera group appearances in the Arrowverse in the episode. Here’s the breakdown of the episode for those in anticipation. Michael Grossman directed the episode written by Chris Fedak & Sarah Nicole Jones. “Justice Society of America” airs on Thursday, October 20 at 8 p.m. ET/PT on The CW.